A SpaceX Dragon cargo capsule is perched at the end of the International Space Station's robotic arm after being grappled by astronauts on March 3, 2013, during the CRS-2 (SpaceX 2) cargo delivery mission. A privately built robotic space capsule filled with supplies for the International Space Station successfully arrived at the orbiting laboratory early Sunday (March 3), one day later than planned due to a temporary thruster glitch. The unmanned Dragon cargo capsule, built by the private spaceflight company SpaceX, was captured by astronauts wielding the space station's robotic arm at 5:31 a.m. EST (1031 GMT) as both spacecraft sailed 243 miles (391 kilometers) above Northern Ukraine. "Congratulations to the SpaceX and the Dragon team in Houston and in California," space station commander Kevin Ford, a NASA astronaut, radioed Mission Control after the successful Dragon arrival. "They say it is not where you start, but where you finish that counts and you guys really finished this one on the mark. You're aboard and we've got lots of science on there to bring aboard and get done." 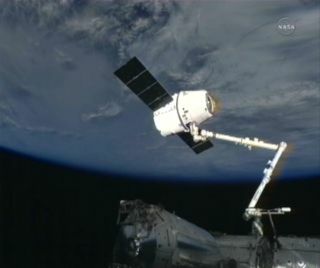 NASA officials said the Dragon capsule is scheduled to be attached to the space station at 9:40 a.m. EST (1440 GMT). You can watch NASA's SpaceX Dragon docking webcast on SPACE.com,courtesy of NASA TV. SpaceX launched the Dragon capsule toward the space station on Friday (March 1), with the spacecraft riding the company's Falcon 9 rocket into orbit. While the launch was smooth, the Dragon capsule ran into trouble after it separated from the Falcon 9 rocket when three of four thruster pods did not activate as planned. A private SpaceX Dragon cargo capsule hovers below the International Space Station on March 3, 2013, just before being captured by the outpost's robotic arm to deliver 1,200 pounds of cargo for NASA during the CRS-2 mission (SpaceX2). The spacecraft's arrival on Sunday, however, appeared to go extremely smoothly, with the capsule being captured by the station's robotic arm an hour earlier than scheduled. "That was a brilliant capture," NASA astronaut Kate Rubins radioed the station crew from Mission Control in Houston. The Dragon space capsule is packed with 1,200 pounds (544 kilograms) for the International Space Station, a haul that includes fresh food, science experiments and other vital equipment. The capsule is also carrying two grapple bars for the station's exterior inside an unpressurized "trunk" — a storage compartment in a cylindrical section of the spacecraft below its re-entry capsule. This mission is SpaceX's third flight to the space station and second official cargo delivery under a $1.6 billion deal with NASA for resupply flights. Under that contract, the Hawthorne, Calif.-based SpaceX has agreed to provide at least 12 Dragon supply flights to the space station. SpaceX launched its first Dragon to the space station last May during a demonstration flight, and followed that success with an official cargo delivery in October. NASA has a similar cargo delivery deal with the Virginia-based Orbital Sciences Corp., which will use its new Cygnus spacecraft and Antares rocket to launch eight cargo missions under a $1.9 billion contract. The first Antares and Cygnus test flights are expected later this year. With the space shuttle fleet retired, NASA is relying on private spacecraft like SpaceX's Dragon capsules to fly cargo — and ultimately astronauts — to the International Space Station. Currently, NASA is dependent on Russia's Soyuz spacecraft to launch American astronauts into space. SpaceX is one of four companies developing manned spacecraft under NASA's commercial crew program. Its manned spacecraft is an enhanced version of the Dragon capsule designed to fly seven people to the station and return them to Earth at mission's end. The Dragon spacecraft that arrived at the space station Sunday will be attached to an open docking port on the outpost's Harmony connecting module later in the day, with unpacking scheduled to begin on Monday. The spacecraft will stay linked to the space station until March 25, when it will be plucked free using the robotic arm and released back into space. Unlike the unmanned Russian, European and Japanese cargo spacecraft that serve the space station, SpaceX's Dragon capsules have a heat shield that allows them to re-enter Earth's atmosphere to return science experiments and other gear. This Dragon is expected to return about 2,700 pounds (1,210 kg) of gear to Earth for NASA when it splashes down in the Pacific Ocean off the coast of Baja California. "What a fantastic day," Ford radioed Mission Control of the smooth Dragon rendezvous Sunday. "Obviously the vehicle is beautiful, the station is beautiful … the prettiest thing of all was the dance."